Grootte van deze voorvertoning: 782 × 600 pixels. Andere resoluties: 313 × 240 pixels | 626 × 480 pixels | 1.001 × 768 pixels | 1.280 × 982 pixels | 2.190 × 1.680 pixels. Because much of the cost of a cow is the feed and labor needed to maintain her, fewer but higher yielding cows mean lower priced milk. Dairy herd improvement ultimately benefits consumers. That's why it's just as important to keep complete and accurate records as it is to keep the cows contented. The National Cooperative Dairy Herd Improvement Program has been tracking Bossy's milk yields since 1905. Over the years, this program has made enormous contributions to dairy cattle breeding. ARS scientists receive the lactation records of all herds enrolled in the program and use the figures to rank the bulls that sire the nation's dairy cows and to rank the cows themselves. The results of years and years of scientific dairying? 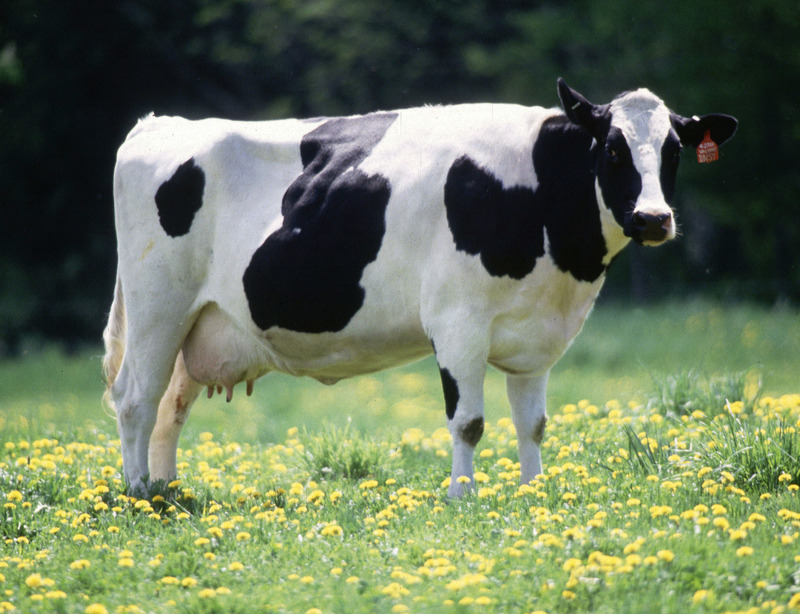 Milk production has been trending upward for more than 25 years in the United States-from about 117,000 million pounds in 1970 to more than 150,000 million pounds in 1994-even though the number of milk cows has been reduced. Dit bestand, dat oorspronkelijk toegevoegd was op www.ars.usda.gov: Image Number K5176-3, werd op 6 april 2019 beoordeeld door de moderator of reviewer Roy17, die bevestigt dat dit bestand beschikbaar was onder de vermelde licentie op die datum.